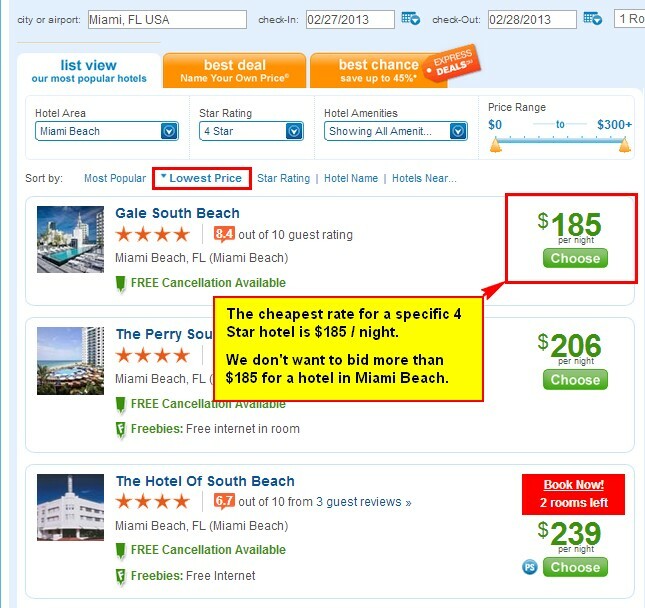 In this article, I’ll comment on how to make sure you get the best price for your Priceline hotel. I’ll also give specific tips on how to bid using the Name Your Own Price feature of Priceline. I will walk you through all the steps involved in making a booking for a hotel in Miami Beach FL. In the next article, I’ll set up a bidding strategy and actually make the booking (assuming Priceline is the best fit). As I mentioned in this article, booking your hotel using Priceline is a great way to lower your costs, if you have any level of flexibility on which hotel you stay at. Over the past several years, since Priceline has come into existence, there has been a lot of knowledge gained by the community on how to get the best deals. When I first saw this, I thought, “wouldn’t it be great if I can just increase my bid by $1 until I get it accepted?” Unfortunately, each time you make a bid, you have to wait 24 hours before you can bid the exact same combinations of neighbourhood, star level and dates. However, you can have another bid by changing one metric. Let’s call that “throwing a wider net”. The key to this part is to make sure that you don’t end up with a hotel that you are not going to be happy with. Reservations are non-refundable, so it is important to ensure that the your least desirable hotel in the area is still acceptable. In the net analogy, we are ensuring that only good fish get caught. Priceline does a great job of laying out the geography of the zones and what the minimum amenities are for each star rating within that zone. For most people, on most trips, this should be enough information with which to base your decision on which zones to bid on. There will be times when you want to have some more confidence that the hotel you get is likely to be one you want. It is a good idea to check the hotel lists to get a sense of what your worst possible option is likely to be. There are 3 resources that I generally use to establish which hotels are in each zone. I have found that Bidding For Travel is usually up to date and has recent won bids in a forum type of set up. Hotel Deals Revealed is probably the cleanest looking but it also appears to be outdated for certain zones. In the Miami Beach example, I want to make sure that every 3 star and above property is acceptable in the 3 zones we specified. Checking out the boards at Bidding For Travel, I get a listing of the hotels. I go through the hotels and realize that all of the 4 star hotels are acceptable. 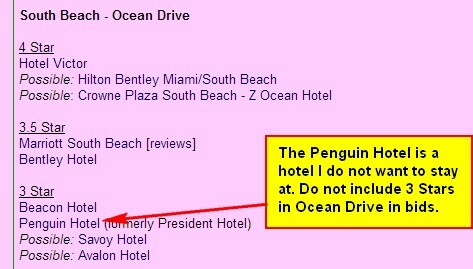 Let’s say that all of the 3 star hotels are acceptable for all 3 zones, except the Penguin Hotel (I had nightmares after watching Batman Returns) in South Beach – Ocean Drive (zone 15). When bidding on Priceline, it is clear that if we have access to more bids, we have more chances to bid lower than our maximum bid. In theory, if we had access to 1000 free re-bids (and enough time), we could start bids at a ridiculously low rate and increase by $1 and bid again until the bid was accepted. This would guarantee that we never paid more than we needed to. Given that it takes about 5 minutes to put in each bid, this would be a little impractical, but if we can increase the number of bids on only our pool of acceptable hotels, we can get a lower rate than otherwise. In the net analogy, Priceline is giving us an extra bid in exchange for us throwing a wider net. In this part, we are making sure that where we widen the net in such a way to not actually catch any more fish that we may not want. What is a free re-bid? A free re-bid is when you allow yourself to get an extra bid without actually increasing the number of hotels that are being bid on. In each neighbourhood or zone, Priceline informs you of the highest star level hotel in that zone. 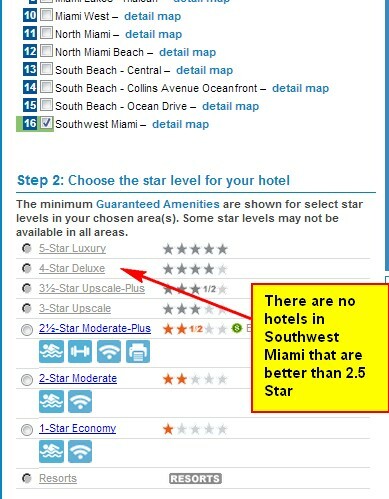 In our example, Southwest Miami (zone 16) has no hotels that are higher than 2.5 stars. That means that if I bid on a hotel that is 3 Star or better, there is no way the hotel I get can be in the Southwest Miami zone. A bid for a 3 Star in either Zone 15 (South Beach) or Zone 16 (Southwest Miami) is the same as a bid for a 3 Star in Zone 15 only. As noted above, when you click on each zone individually, the list of eligible star level hotels are listed (see the screenshot for Southwest Miami above. 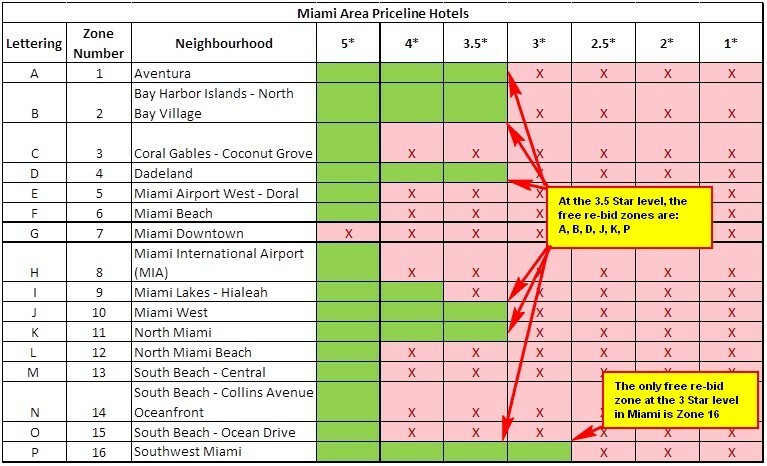 When looking at a bid, you can go through all the zones in the metro region (in this case Greater Miami) and list out which zones have hotels in each of the star levels. Here is the listing for Miami Beach. The areas highlighted in green represent the free re-bid zones. For example, if you are bidding on a 3 Star hotel in Miami zone 15 (O), the only free re-bid zone would be zone 16 (P). That is the only zone where there is no hotel of 3 Star or better. A request for a 3 Star in zone (O or P) is the same as a request for a 3 Star in zone (O). To calculate the number of free re-bids, you will need to see how many zones have free re-bids for your request. I will go into detail on how to do this for Miami Beach on a 4 Star bid. For simplicity, I’ll assume that I have to be in Zone 15 – South Beach – Ocean Drive (O). A bid for OAB is a bid for any 4 Star hotel in any of those 3 zones. Following that with an OB would be rejected by Priceline as a repeated bid. This is because the bid OB was already tested in OAB. As a result, it is important to make sure to do all of your 2 zone bids, before you do any 3 zone bids. You will have to start your bidding from the beginning each time though. If you just add zone B to a rejected OA bid, you will have an OAB bid. It is important to find out what rate you would be able to pay for the hotels you are bidding on if you didnt bid. It is important to do this so that you do not overbid and you have a good idea of where to set your bidding strategy. If you can buy the hotel you want for $80, you should not be bidding $120 for the same one. Some notes: You should probably do this for every Star level independently. You should also use the lowest price for an acceptable hotel as your baseline. This is important if 4 Star hotels are cheaper than 3 Star hotels (for some reason). If you bid on a 3 Star or better, use the lower price, which in this case is the 4 Star hotel. Hotwire Is great in that they will show you what you can pay for a hotel given the Star level and neighbourhood. Sometimes the Hotwire and Priceline have slightly different hotels and neighbourhoods specified, so it is not exact. Knowing what you can pay Hotwire for an acceptable room will allow you to set your cap on your bids through Priceline. Note: You will want to ensure that the hotels that Hotwire is offering are acceptable using the same techniques I mentioned for checking the hotels at Priceline. Priceline List View will allow you to see what the rack rates are for your acceptable hotels. I generally don’t look at these but it is a good idea to know if there is a very cheap acceptable hotel there. Priceline’s Express Deals is the best way to gauge what you should be paying. 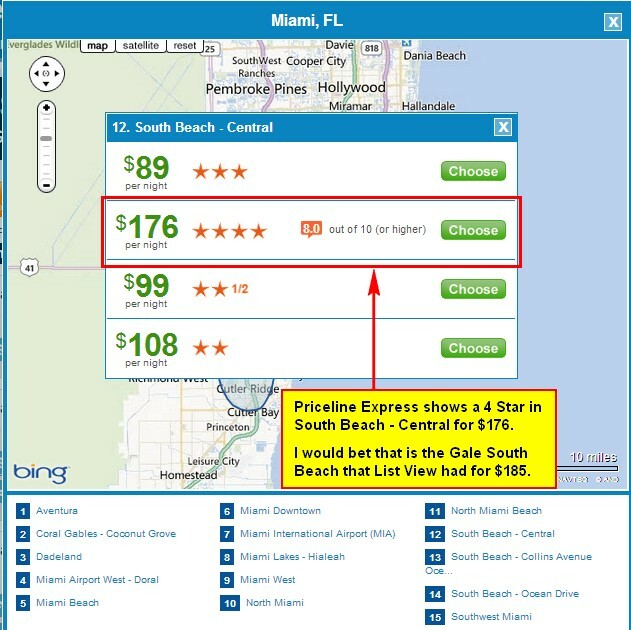 You can check what Priceline wants for a hotel given what you are bidding on. That is great information since the zones and star ratings should line up exactly. So based on the information in the table, we know what the most we have to bid on Priceline before we can throw in the towel. In this case, I would make the decision to simply target the 4 Star hotel ONLY and pay $118 for it if Priceline can’t get me a better rate. 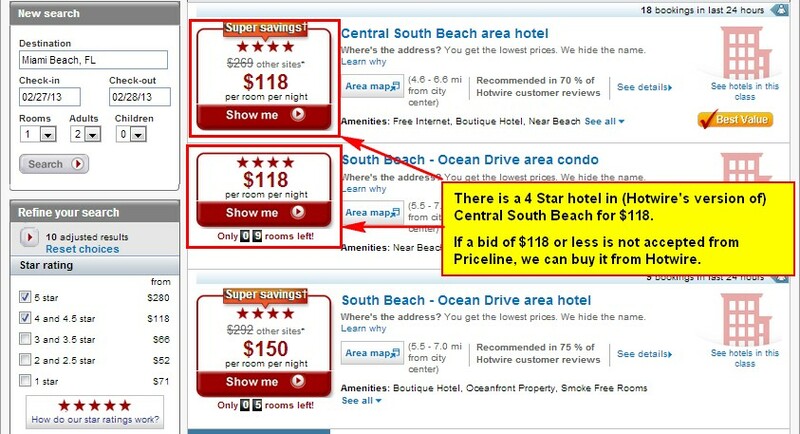 A note: In this exercise, we realize that Hotwire actually has significant discounts compared to Priceline. In this case, it may seem that Hotwire has better rates and we are quite likely to end up with a hotel through Hotwire instead of Priceline, which would be fine. Don't subscribe All Replies to my comments Notify me of followup comments via e-mail. You can also <a href='https://www.creditwalk.ca/comment-subscriptions/?srp=745&srk=2648578ecea05c83754707575dc5a494&sra=s&srsrc=f'>subscribe</a> without commenting.